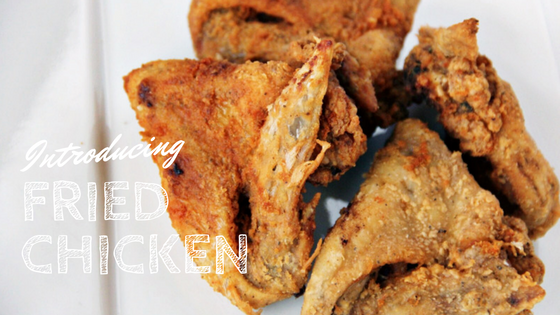 Wanted to share my recipe for Fried Chicken on the blog, as some of you have sent in your questions and asked how my family makes this meal. Fried Chicken is definitely a staple in the African American culture, and how it's prepared has been passed down from generation to generation. 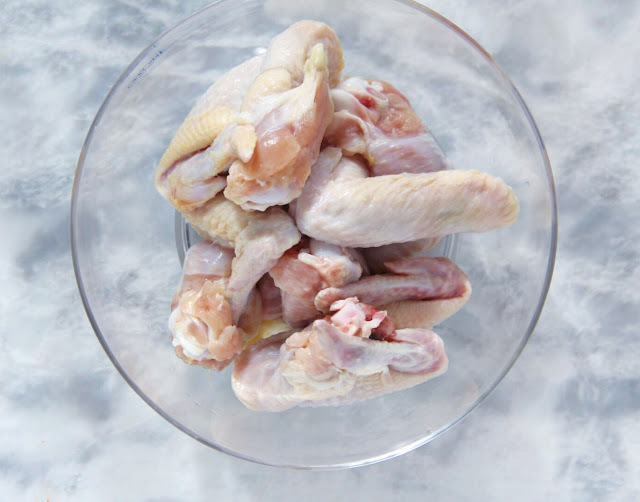 There's so many ways to make friend chicken, so many different types of grease to fry it in, so I'm just going to share with you how my family makes it. It's super easy, and super quick, but so good! I've never been a fan of commercially cooked fried chicken like KFC, Popeye's, or Harold's Chicken. (My Chicago folks know the deal) and those are all still really good options (minus KFC) but I'd rather my chicken be cooked in my kitchen, with my seasonings, with my flour, and in my grease! Feel free to share your favorite ways to make fried chicken, and to learn mines, keep reading! 1. Start by cleaning your wings, entirely. They come sometimes really bloody, or with small feathers still attached. I usually spend alot of time cleaning my chicken, because you don't want to eat the gross stuff. Clean all the folds, rub the grit off of them under cold water, and remove any particles you don't want to eat. Once entirely clean, fold them into little triangles. 2. Season Away! This can make or break your chicken at the end of the day lol. I keep it simple with my seasonings because I don't want my chicken too salty, but I still want enough flavor. Lawrys is a staple seasoning salt, because it gives all my meats that good flavor I need, without making it salty or too bland. I usually season my chicken with Lawry's first, and then pepper, and then the garlic seasoning. I don't measure how much I use, I just eyeball it. You can tell when you have way too much. One rule of thumb I use, is if you can't see the skin of the meat anymore, that means you have too much seasoning. The good thing with chicken is if its too much seasoning, you can always rinse it off with cold water, and start over. 3. Make sure the entire wing is coated in seasoning. I usally start on one side, and turn it to the other side to season. What makes this part really easy to do, and to cleanup, is putting a large bowl in your sink, and cleaning/seasoning your seasonings in that bowl, like so. 4. In an old paper bag, or grocery bag ( we clearly ran out of paper bags), pour about 2 cups of all purpose flour in your bag. Double the bag because it can get really messy once you start to flour your chicken. 5. After your bag is doubled, and you have a good amount of flour in your bag, place 1 -2 pieces of chicken in the bag, hold the bag closed with your hands, and shake! You want to make sure every inch of your wings are covered in flour. Repeat this step until all of your wings are fully floured. 6. Get a large pot out, and pour about a half a bottle of canola oil into the pot and put on medium to high heat. You want your grease to get nice and hot before putting your chicken wings in. I usually start my grease before I flour my chicken because it doesn't take long for the grease to get hot. 7. You know your grease is hot when you start to hear it popping. Once it starts popping start to put your wings in one at a time. Be careful!! The grease is popping, which means you can get popped with grease, and burn yourself. So place them into the pot with a fork, or kitchen tongs, and place them in the pot very slowly. Depending on how big your pot it, you might be able to fit all of your wings in at one time. I usually throw 3 - 4 in at a time to fry. 8. It doesnt take long to fry, so if you are frying chicken, I'd stand over the stove just to make sure you aren't distracted by anything else. It's super easy to walk away, and then come back to burned chicken. Trust me I know :) You'll notice as your chicken fries, it starts to bleed. You will see blood in the pot, but that means it's cooking on the inside. I usually keep them frying on one side for about 3 - 5 minutes, and flip it over to the other. 9. Your chicken should be done once they are golden brown, and crispy on the outside like the photo. Sometimes to test, I just take one out, and pull the meat back on the inside to see if its done. If not, I throw it back in. 10. Make sure you have a plate with paper towels ontop of the plate. Once your chicken is done you will want to put it directly on the paper toweled plate, so that it can catch the grease dripping off of the chicken. 11. And walah! You're done! Easy right? Serve with any side that you want, and pair with your favorite dipping sauce. I'm a hot sauce girl, so Louisiana hot sauce is my JAM. Let me know how your's turned out, and send me your pics/snaps! I can't wait to see what you think.